rainwater to mains water switch. Knowing what accessories are normally purchased with a rainwater tank will help you compare value for money and obtain the best deal. When you purchase a rainwater tank ensure the holes will be cut in the correct locations and that the inlet, outlet and overflow will be appropriately fitted. A common mistake is to cut an outlet too low on the tank. This causes the tank to draw from the bottom, dirtier part of the water. It is best to position your outlet at least 80mm from bottom of tank. Make sure to use quality brass fittings for your outlets to ensure your water quality is not tainted. Tank fittings are commonly fitted by the tank manufacturer at the manufacturing facility or by the tank delivery person onsite. On top of your tank where rainwater flows in you will need an inlet strainer. This provides you with higher quality water by stopping leaves, debris and other matter from entering your water tank. In addition, you will need to screen your tank overflow to stop mosquitoes, insects and frogs climbing up your pipe and entering your tank. Once your rainwater tank fills up, excess rainwater can overflow into another tank that you have setup, or down into your stormwater drain pipes. Before rainwater falls through from your gutter, you can install a rain head at the top of your downpipe to prevent debris entering your tank. If you receive an excess of leaves dropping on your roof, a rain head will help to prevent blockages in your down pipe as well as reducing how often you need to empty the gunk that collects in your water diverter. When it rains the initial rainwater can wash down from your roof and gutters into your water tank – debris, dead insects, leaves and the like. Rainwater diverters work by diverting the initial rainfall, up to 60 litres or so, from entering your tank. This improves the quality of water entering your tank. When plumbing in your rainwater to your house or property, you will need a water pump to pressure your rainwater to where you need it. Unless you live in a bushfire prone area, an electrical pump is all you will need. Quality pump brands known for their reliability in Australia are Davey and ClayTech. With a rainwater to mains water switch (also known as a mains water backup system) you don’t have to worry about rainwater running out in your tank. When your tank is running low on rainwater or empty, a mains water backup system can automatically switch to your mains water supply. 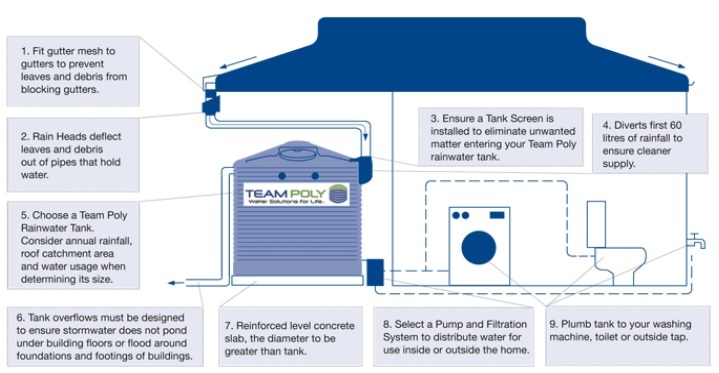 If you’d like more information about Team Poly’s water tank accessories range, contact our expert team of customer care representatives – we’ll be glad to help.